Industry-leading products and services for robotics, motion control systems, vision systems and factory automation. The team at Glaze Tool and Engineering utilizes robotics in many of our systems to maximize speed and accuracy. Robots are ideal for the most demanding and complex production requirements, and our engineers are experts in integrating robots into automated assembly systems. 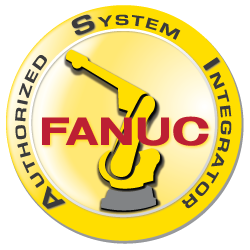 In fact, we are an authorized integrator for FANUC America, one of the leading providers of factory automation. We work with you through the entire system development process, from initial systems concept to final integration. All along the way, our engineers can help you make informed decisions about your manufacturing requirements and resources. •	Free initial consultation and equipment quotation. •	Help with selecting the level of automation you need to meet your manufacturing requirements. •	Product Design (or redesign) for Automatic Assembly, if requested or required. •	System Design for your review, refined specifications and system acceptance criteria. •	System fabrication and assembly of equipment to mutually agreed-upon specifications. •	System "run off" to prove to your satisfaction that the equipment will meet these specifications. •	Help during system installation and production initiation.